I was delayed so much that I almost thought I should not do this post. However after taking a theme that was so interesting as Detox, I had to attempt at completing this week. When I have posted the second day Detox drink, I have so many other bloggers saying how wonderful it was I was doing this theme. Ganga wrote back to me referring a couple of Ayurvedic Detox recipes, which she has been doing. That made me look up on this and found so many useful detox dishes that we have been cooking in our regular Indian cuisine, only I didn’t know about it. 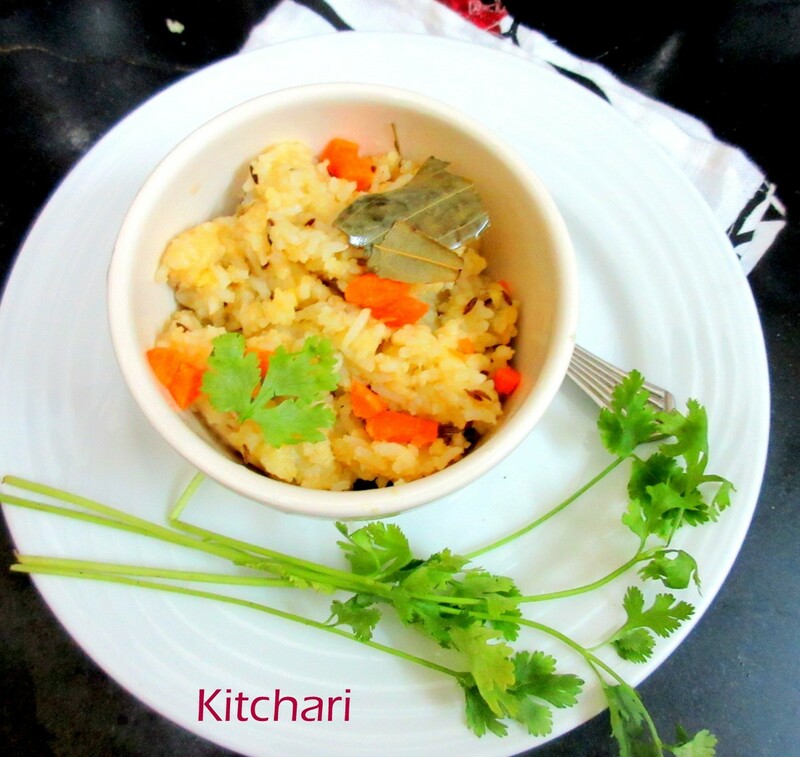 I opted to cook this Kitchari, which is almost like our Ven Pongal with a slight tweak to the recipe. I was supposed to cook much before, I simply couldn’t find the right time. This surely makes a great dish to enjoy. I haven’t read very deep into the concept of doshas, however from this website, it says that this is ideal to eat for a day after the moong bean soup cleanse that is given on the same page, as it’s a key recipe for Ayurvedic nutritional healing, especially in illness or detoxing. Good for all doshas. Sauté mustard seeds in ghee till they pop, then add other spices, starting with the seeds and the powders. Add moong dal and rice and sauté for 2 minutes. Add water. Prepare vegetables and cut into small pieces. Add vegetables, salt, and extra water if required and cover with lid, pressure cook for 3 whistles. Wait for the pressure to fall down, before fluffing and serving hot. The original recipe call for cooking in a pan, I cooked in Pressure cooker. So rice and dal were cooked first and then tempering was done. 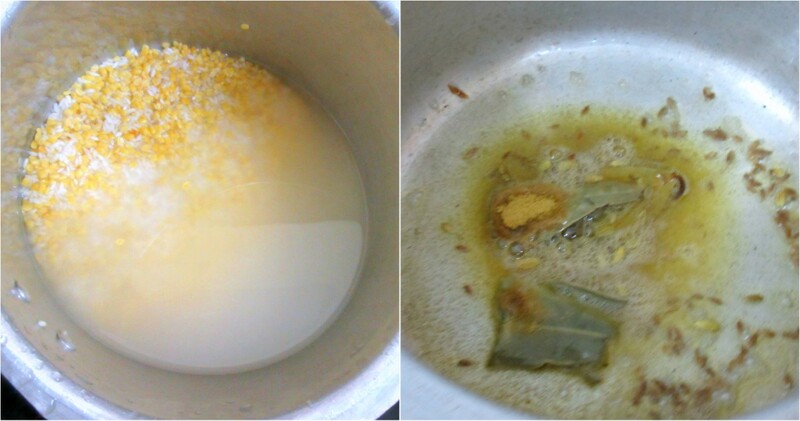 The cooked dal and rice were mixed with the tempering and extra water can be added depending the consistency. Hi Srivalli, How wonderful to see this recipe, and to find out how healthy some common dishes are. Ayurveda is very powerful, I love its approach. This is a nice dish for detox Valli. Will never feel like dieting as it includes rice. 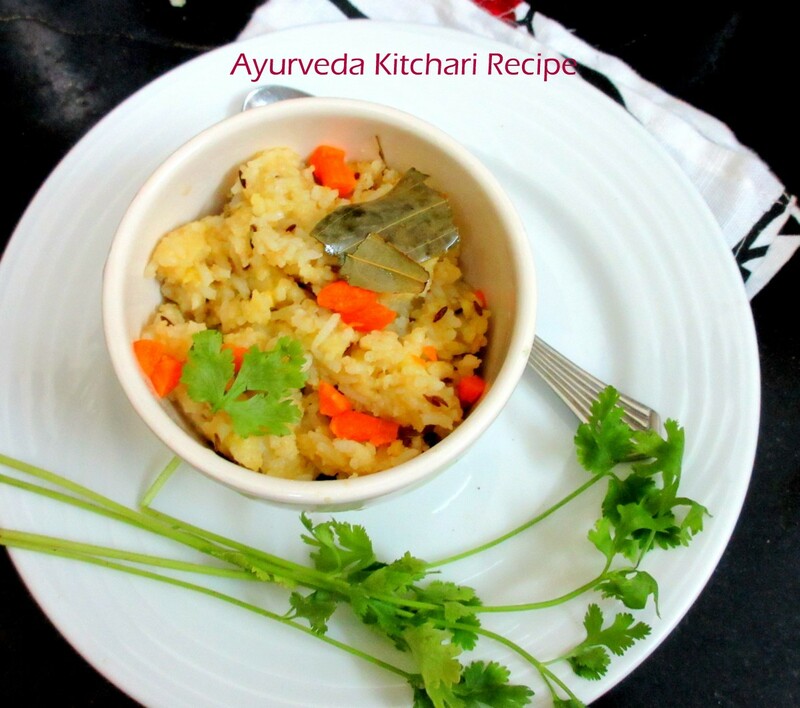 Detox khichdi looks delicious and healthy too. Sounds super interesting Valli, now am waiting to make some soon. You are making detox so yummy….must try this one! Such a filling and delicious kitchari Valli.